About M.E. Dey | M.E. Dey & Co. Celebrating 110 years of tradition and innovation. With specialists in Logistics, Customs Brokerage, Export and Compliance, M.E. 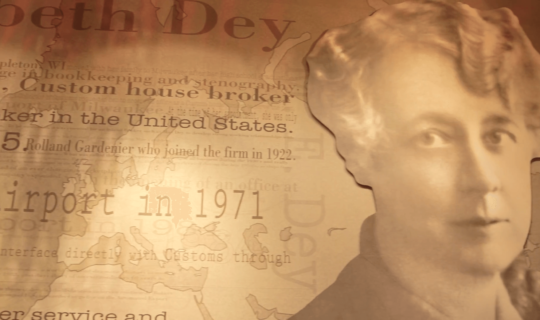 Dey & Co. is one of the largest family-owned Brokers and Forwarders in the United States. We offer personal and professional attention, while developing long-term relationships with our clients. Shipment status updates and Information vital to you is available 24/7 via our web tracking program to help you manage your Logistics. With world-wide connections and a commitment to great service – We Deliver the World! I just want to reach out and thank Tammy Danielson for all her patience and extra work she put in to help me. I had no idea what I was doing and was quite frustrated with a situation I haven’t had experience with. Tammy was incredibly patient and reminded me that she had been in my situation before and I really could not have accomplished much without her knowledgeable assistance. She was always available by phone and email when I needed assistance. Saying that Tammy went above and beyond seems an understatement. I just can’t thank her enough for the extra help she provided with a stressful situation. Our company, Gilson Inc uses ME Dey for brokering. I think we have had a relationship with your company for some time. I have never had a bad experience with the people I have been in contact with and everyone seems to always be quick to respond. Thank you for the service you provide.